BIAFRA: President Buhari's unprovoked taunting of Igbo-Biafran corpers----Authority Newspapers Blasts Buhari. BIAFRA: President Buhari's unprovoked taunting of Igbo corpers--Authority Newspapers Blasts Buhari. At the traditional homage usually paid to the president in his hometown, Daura in Katsina state during festivities, General Muhammadu Buhari, in a statement by his Senior Special Assistant on Media and Publicity Mallam Garba Shehu, on Tuesday, September 12, singled out NYSC members from the South East for taunting. 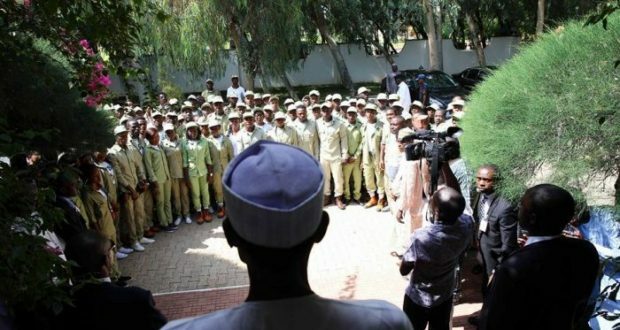 Out of the about 100 youth corps members who had gone to felicitate with the president in the spirit of the Eid el Kabir, the president reportedly called out the youths from the two geopolitical zones and handed them a strong message – to go tell their people that “…Biafra is wishful thinking”. According to the statement, “Speaking specifically to corps members from the South Eastern states, the president said: “Tell your colleagues who want Biafra to forget about it” , among other things. It is unbelievable that such an action was taken by the president who is supposed to be a father-figure to all Nigerians, especially in a democratic dispensation. As always, President Buhari who has become accustomed to taking belligerence to everything under the sun, missed the target. Given the fact that the National Youth Corps Service scheme was set up in the aftermath of the civil war to provide a powerful integrative mechanism to unite the nation’s diverse entities, the president was perhaps ventilating his bottled up emotions to the wrong audience. It is patently pathetic that he chose an occasion like Eid el Kabir to embarrass innocent youths, all of who were not born before the war. We at The AUTHORITY are saddened by the incessant acts of provocation by the same people whose collective action or inaction has brought the country to its knees. Why wouldn’t the president seal his lips if he had nothing good to say to his young guests who had gone to honour him amidst pervading hunger in the land? He ought to have demonstrated statesmanship and circumspection. The times call for reconciliatory moves, not bitterness. We recall that on May 29, 2000, at the first anniversary of his administration as a democratically elected president of Nigeria, Chief Olusegun Obasanjo granted amnesty to 1,520 officers of Igbo extraction who were dismissed from the Nigeria Police Force for allegedly participating in the civil war as Biafrans. He also extended the amnesty to the ex-Nigerian soldiers who served in Biafra, from which no less than the Biafran leader, Ojukwu, benefitted. Their dismissals were converted to retirements from that day even as he directed the authorities to commence payment of their benefits. The entitlements of late officers were paid to their families. That gesture by the former president was commendable, even though it came belatedly. It was interesting to note that after several years of trying to paper over serious cracks on the nation’s body politic, the Obasanjo administration had, through that singular act, recognised the need to heal old wounds as a prerequisite for the much needed national reconciliation. By that action, Obasanjo exhibited some level of magnanimity as a veteran of the civil war. Nigerians had expected Gen. Buhari to continue from where Obasanjo stopped by extending the gesture to other agencies like Immigration, the Nigerian Customs Service, the Prisons Service and the entire civil service. Unfortunately, rather than seize the rare opportunity of his first anniversary in office as a democratic leader to display an act of prerogative of mercy, President Buhari used the occasion to attack his real and imaginary enemies in the face of a comatose national economy under his watch. The United States of America also fought a civil war between 1861 and 1865. In March 1861, the Southern states in the United States withdrew and set up the Confederate States of America, seeking to preserve slavery and to avoid the growing dominance of the industrial North. The Northern States, under the leadership of Abraham Lincoln, refused to grant the right of Southern states to secede, and in April, 1861, war started. The war which lasted four years recorded a casualty figure of about one million dead. Parts of the Southern states were decimated. Finally, the North prevailed. Yet, today, the United States remains firmly united both in name and in character. What has made the Nigerian case different is the seeming stubbornness on the part of those who have continued to run the affairs of the nation to make some concessions to others in terms of opportunities, privileges and appointments. It is the failure of those who are entrusted with the national responsibility of husbanding a truly cooperative federalism that has led to the prevailing perception in large and essential quarters that some are using the federal arrangement to unfairly lord it over others. This phenomenon has been there even before the British handed over political power to indigenous Nigerians at independence in 1960. The aggregate effect of these developments is to weaken the cohesion of the Nigerian union. Another equally destructive factor is the lopsided way certain people have been (and are being) treated in the political power game. The real test as to how determined we are in this process of national reconciliation is the way we treat the well-demonstrated case for power-sharing and rotational presidency. As long as political power at the federal level is made to look like the private privilege of a few people from certain parts of the country to the exclusion of others, for so long national reconciliation will become a receding mirage. Nigeria has tried to forge ahead with certain federal character principles as enshrined in Section 14 of the Constitution. But these basic principles have started diminishing from the actions and appointments of the present Federal Government under the leadership of President Buhari. Yet the president regrettably talks tough at every turn and twist as though he is still a maximum military ruler. This is what, as many believe, has helped to aggravate tension in the land. His consistent rage against the Igbo and their brethren in the South South is pretty hard to understand. It should be clear that by the level of their involvement is all aspects of Nigeria’s socio-economic life, the Igbo could not be seeking for separation, but for inclusion and recognition in a country which they have laboured so hard to build.